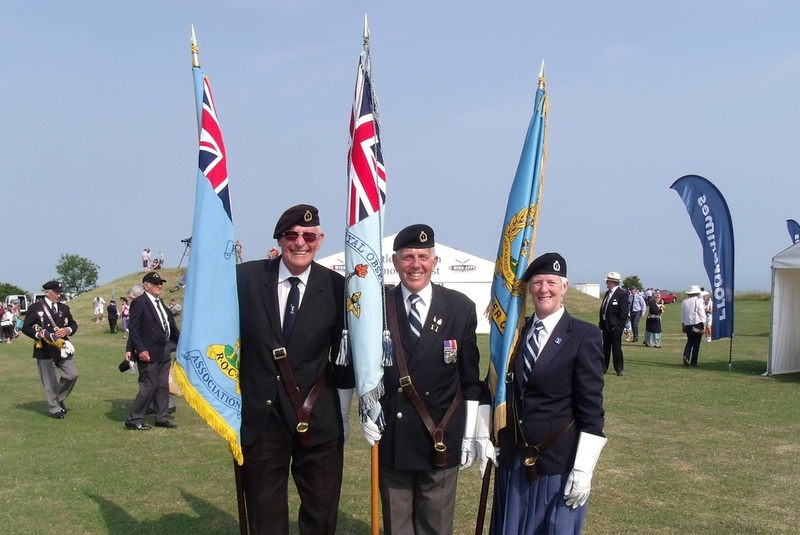 Capel le Ferne 2013 - Royal Observer Corps Association This website was set up in October 2012 and is the new official site for the Royal Observer Corps Association. A Memorial to "The Few". - The Memorial wall can be seen in the background. 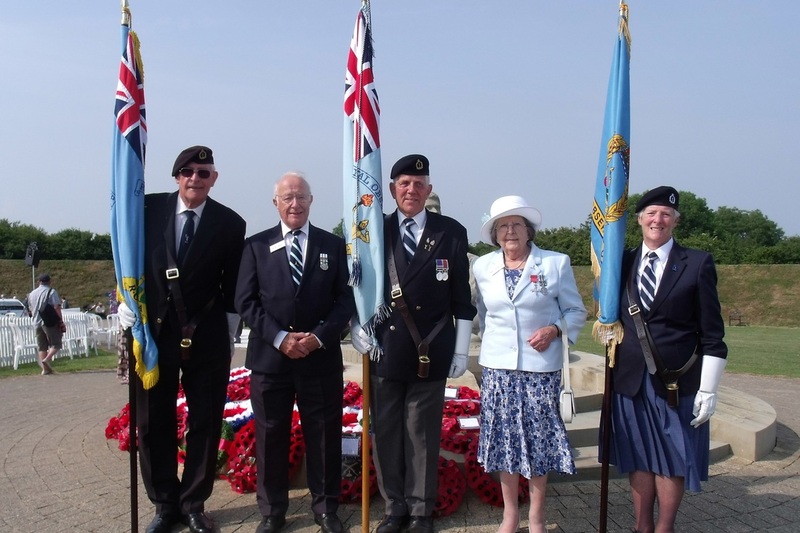 The National Memorial to the Few was unveiled at Capel le Ferne Kent, twenty years ago, by Her Late Majesty Queen Elizabeth the Queen Mother, on 9th July 1993. The memorial was inspired by Wing Commander Geoffrey Page who flew Hurricanes with 56 Squadron during the Battle. 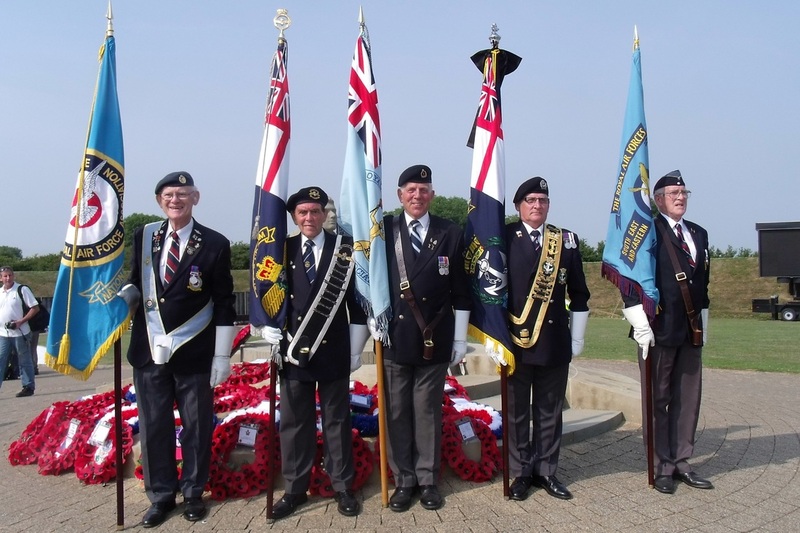 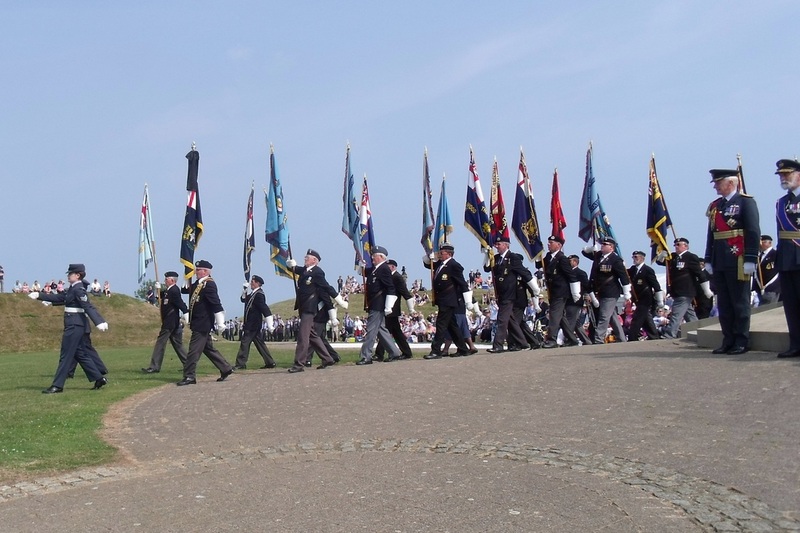 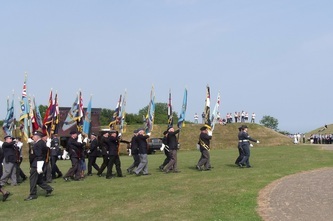 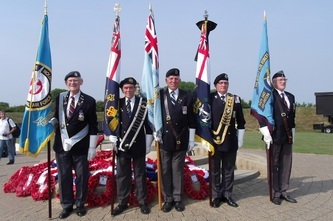 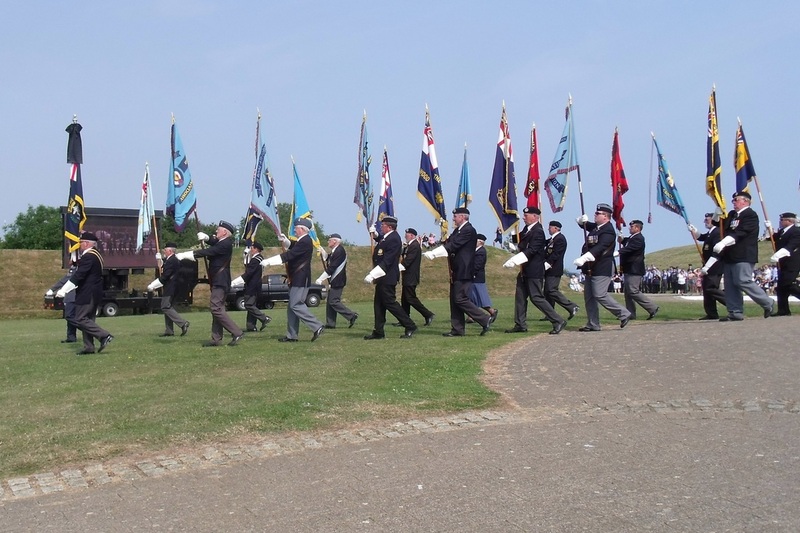 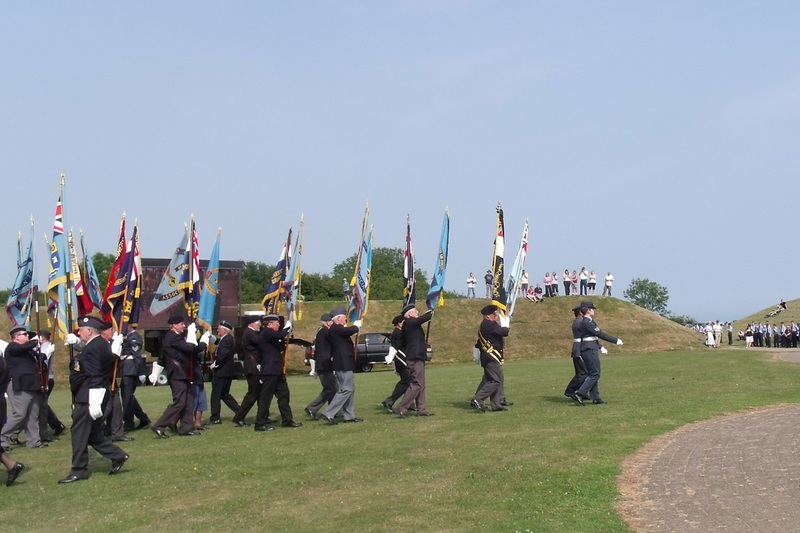 The Memorial Day Service, in July each year, draws many thousands of visitors to the cliff tops, above which the Battle was fought and won by the pilots and ground crews of RAF Fighter Command, and other Allied Air Forces. 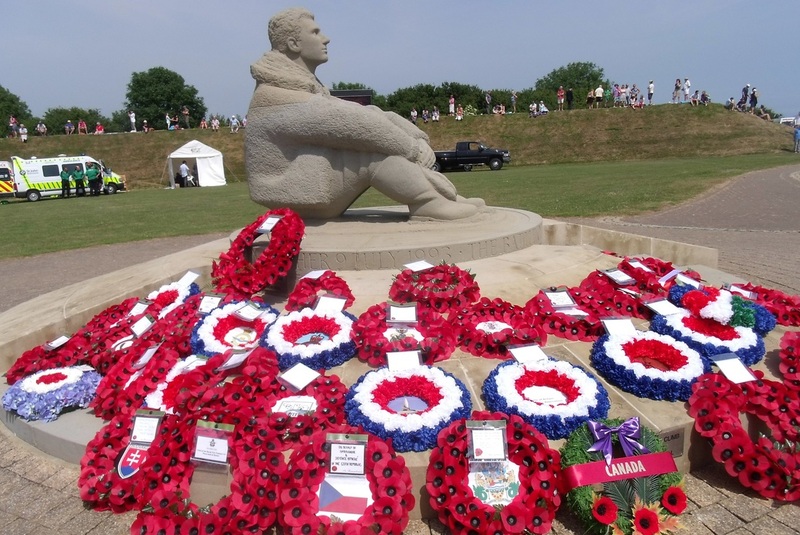 The memorial has, over the years, developed from a simple Memorial Stone into a magnificent Statue of a lone Fighter Pilot looking skywards over the English Channel. The figure sits on a central plinth which forms the hub of a large three bladed propeller set out on the grass on the cliffs. 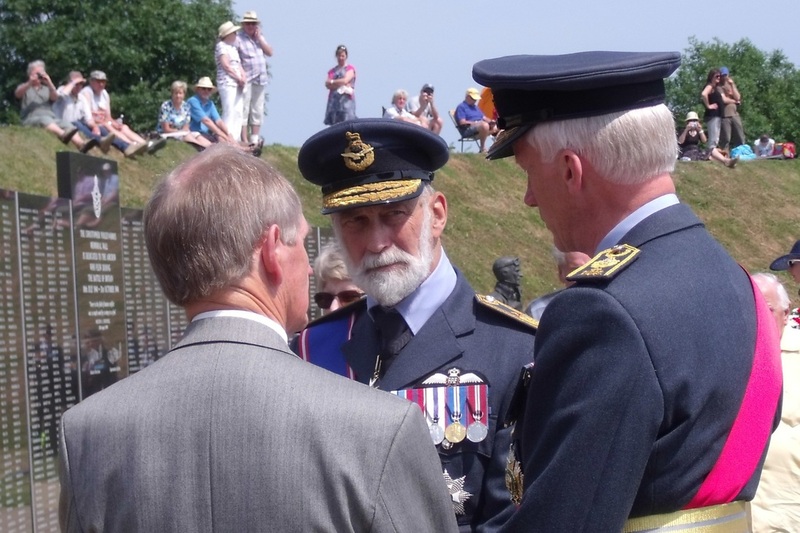 The Hunting Lodge Visitors centre was added in 1995, funded by Clive Hunting, and opened by Air Chief Marshal Sir Michael Graydon, then Chief of the Air Staff and now President of the Memorial Trust. In 2005 the Christopher Foxley-Norris Wall was unveiled by HRH Prince Michael of Kent. 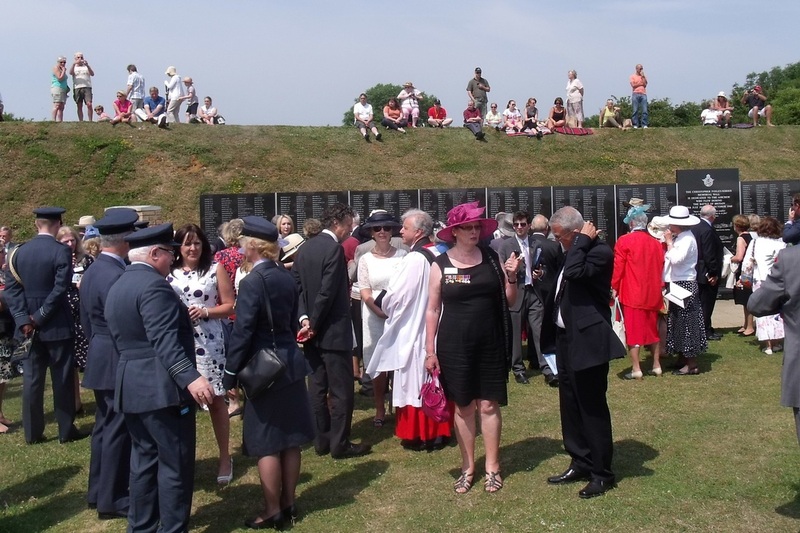 The wall carries Winston Churchill's immortal words "Never in the field of human conflict was so much owed by so many to so few", and lists the names of all 2,937 members of those who took part in the Battle from July to October 1940 . 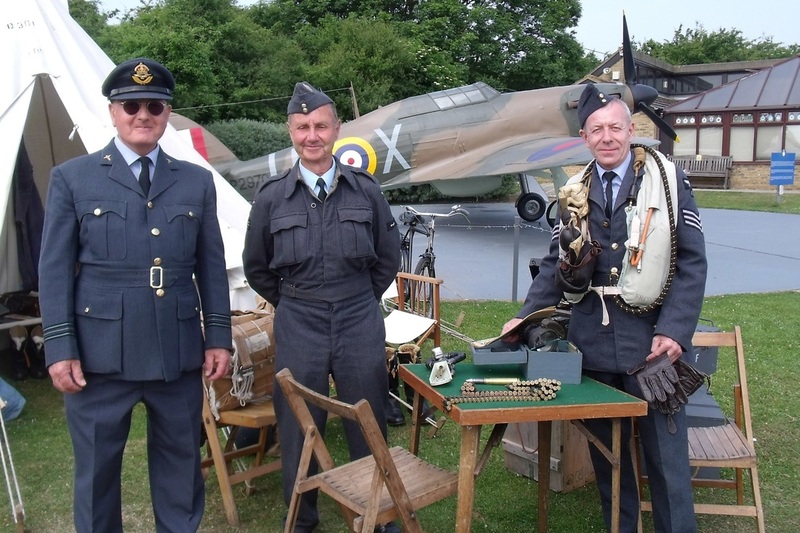 The site also boasts two replica aircraft, a Spitfire and a Hurricane, the two fighters most associated with the Battle of Britain. 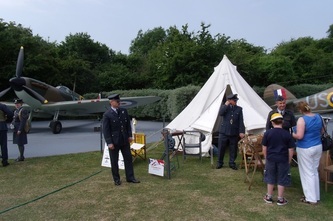 The Hurricane Mk 1 replica was generously donated by the Tory Family Foundation, and represents the aircraft in which Pilot Officer Geoffrey Page was shot down on the 12th August 1940. The Spitfire replica is a tribute to Jeffrey Quill OBE AFC who left the RAF in 1935 to become assistant to Mutt Summers the Chief Test Pilot at Vickers Aviation. 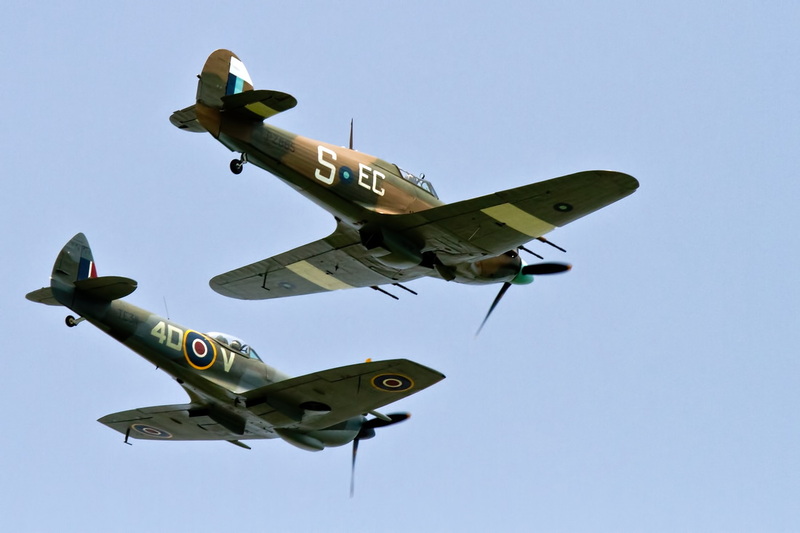 After flying the prototype Spitfire on March 26th 1936 he managed to secure an attachment to No. 65 Squadron based at Hornchurch, in August 1940, in order to appreciate more fully what pilots were demanding of the Spitfire. 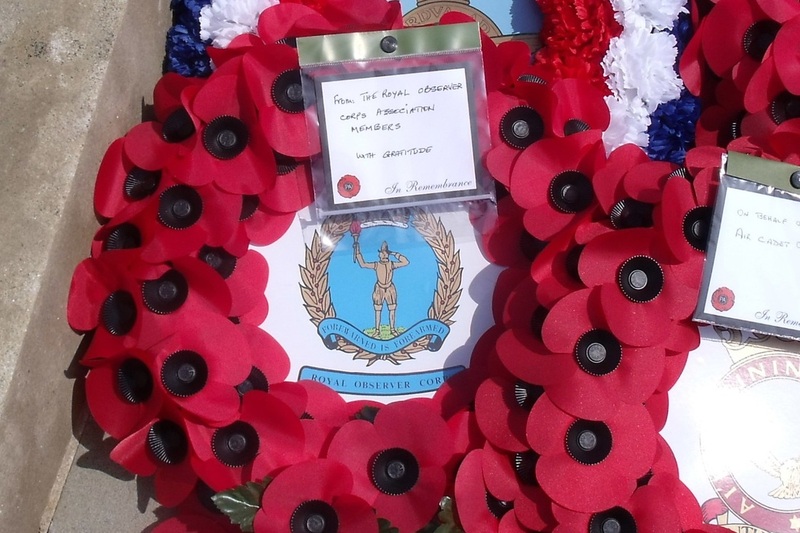 He shot down an ME Bf 109E and shared in the destruction of an He 111 bomber. 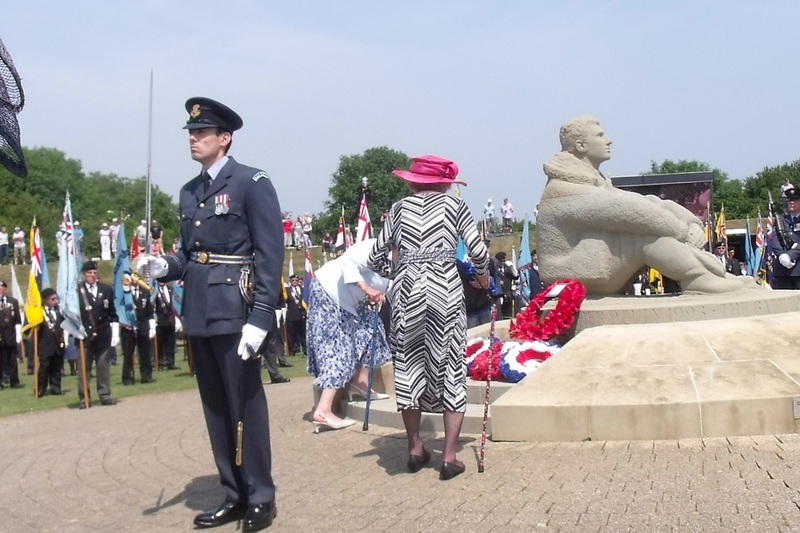 Recent additions to the site include a bust of Air Chief Marshal Sir Keith Park unveiled in October 2010 by HRH The Duchess of Cornwall, and an inscribed copy of "Our Wall" a poem by Flt. 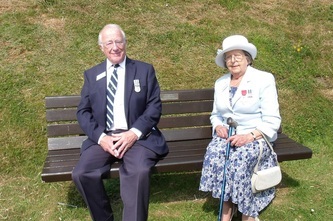 Lt. William Walker AE a much loved Veteran who died in November 2012. 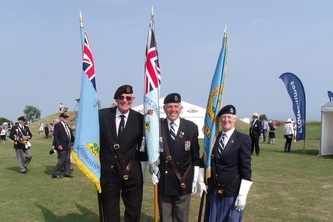 Editors note: Much the above text was adapted from the official 2013 Souvenir Programme. 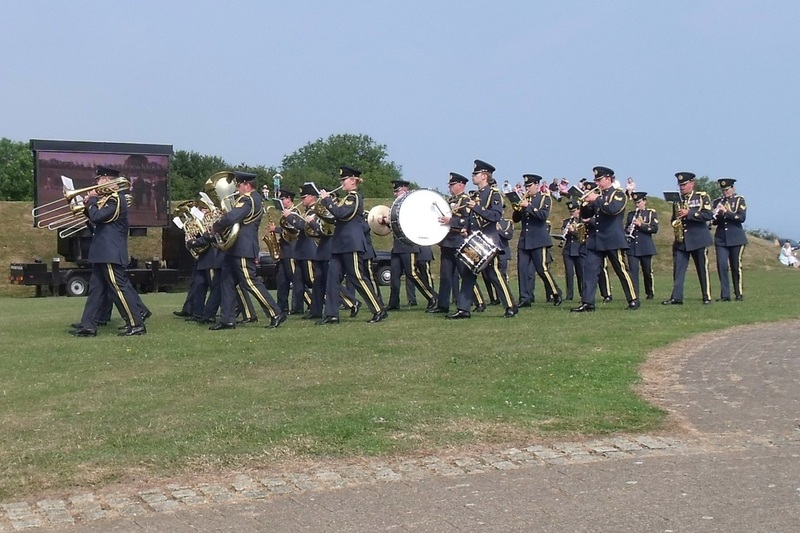 The days events started with music from the band of 305 (Ashford) Squadron ATC, followed by the entry of the Central Band of The Royal Air Force. 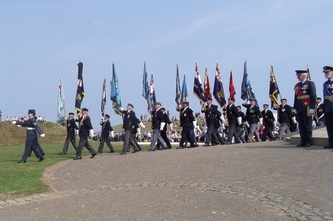 Marching on to form up for the parade were the Kent Wing of the ATC, followed by the Standards and Banners including the Polish Air Force replica standard, and the RAF Silk Ensign paraded by the Queen's Colour Squadron. 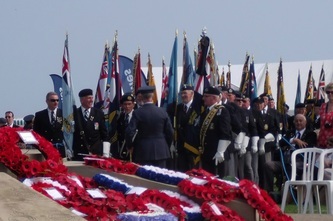 The twelve remaining Veterans of the Battle of Britain then entered the arena, to the emotional applause of all the people gathered there. The General Salute was taken by HRH Prince Michael of Kent GCVO. 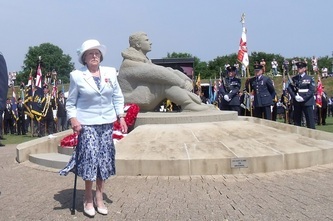 Patron of the Battle of Britain Memorial Trust. 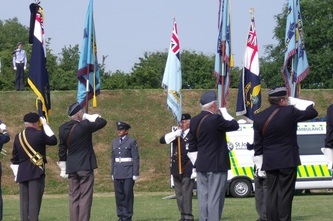 At this precise moment the silence was shattered with the arrival of the Spitfire and Hurricane of the BBMF. As the unforgettable sound of the Merlin engines filled the air, one wondered what memories went through the minds of the ageing but proud veterans watching from below. 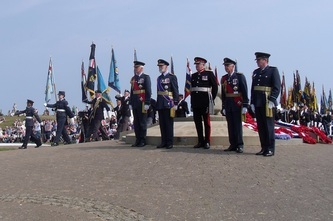 Air Chief Marshal Sir Michael Graydon GCB CBE, President of the Battle of Britain Memorial Trust, introduced Air Chief Marshal Sir Stephen Dalton GCB ADC BSc FRAeS CCMI RAF Chief of the Air Staff who welcomed all to the Service which was conducted by the Venerable (AVM) Ray Pentland CB QHC Chaplain in Chief of the Royal Air Force. 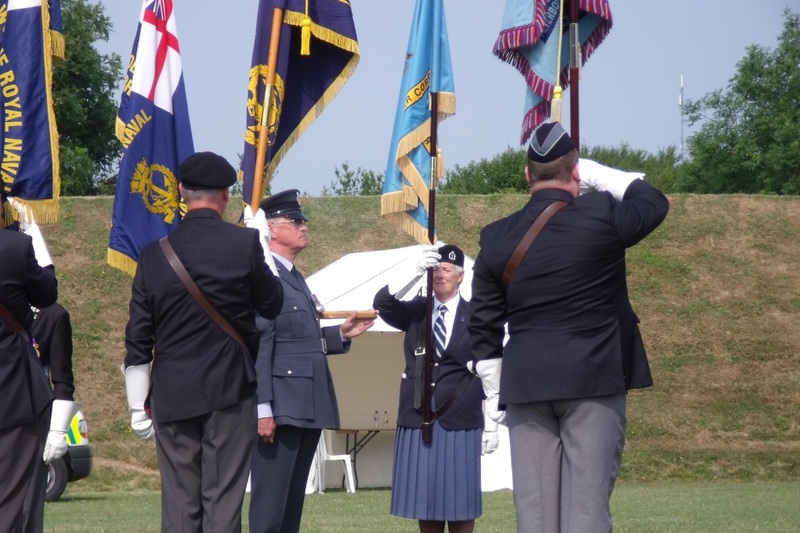 Assisting him were the Reverend (Sqn Ldr) Matthew Buchanan RAuxAF and the Reverend Brian Williams Priest of St. Radigunds Capel-le-Ferne. Among the laying of tributes was our National Vice President Mrs Joyce Shrubbs MBE, who laid a Poppy wreath on behalf of the Royal Observer Corps Association. 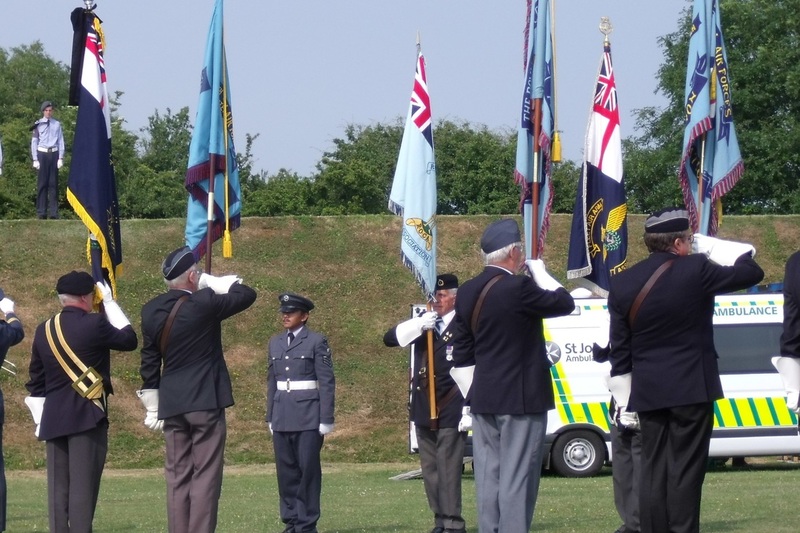 The Spitfire and Hurricane returned to give another superb flying display, and the whole day was rounded off with a Sunset Ceremony and the National Anthem. 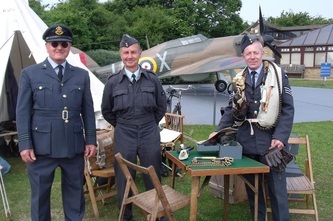 The photographs below were taken by M. Marks with the exception of the Spitfire and Hurricane one, which was kindly sent in by Chris Gritt of 14 Group.